JP MicroFit™ Takedown Pins are the answer to poor receiver fit. 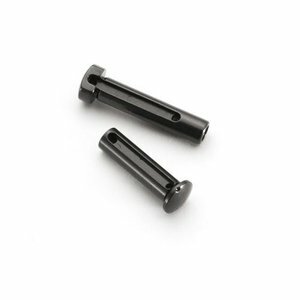 Available in standard, oversized and undersized, MicroFit™ pins provide a receiver fit that satisfies by compensating for the loose or tight fit that can't be helped. A good receiver fit should be snug but not frustratingly tight. That was the goal with our original JP Tension Pin, but MicroFit™ pins provide the same result without tool-assisted takedown. For all but the very sloppiest receivers, MicroFit™ is your ticket to a more refined rifle. Now standard on all JP rifles, MicroFit™ pins receive the same polished black QPQ coating as our bolt carriers for high durability, corrosion resistance and of course, sheet prettiness.